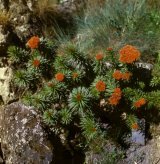 This genus was split from the genus Sedum L. Some 20-40 species, depending on classification in the Northern Temperate zone. About 20 species in the FSU. R. rosea L. is used not only as an ornamental species but also as an important medicinal plant. Central Asia (Narynskiy Range, Terskeiy Alatau, Alayskiy Range), northern China and Tibet. On rocky slopes, in cracks, on gravelly soil. Plant 20-50 cm. Taproot and short rhizome thickened, tuber-like. Stem unbranched, densely leafy. Leaves sessile, linear-lanceolate, sparsely toothed. Inflorescence terminal, hemispherical, of densely crowded small yellow flowers. Specimens with staminate flowers are much more ornamental than specimens with pistillate flowers. V - early spring to early autumn in St. Petersburg April-September. Fl - May. Fr - June-July. P - by seed and division of the stout, underground rootstock. Does well in full sun and in partial shade. Well suited to the rock garden. Z 4 (3). Central Asia (Tien Shan, Narynskiy, Aleksandrovskiy Ranges, Zailiyskiy Alatau) and northern China. High mountain meadows, on thin soil near timberline, on rocks. Plant 25-40 cm. Stems numerous, densely leafy. Leaves alternate, sessile, linear-lanceolate, toothed near the apex. 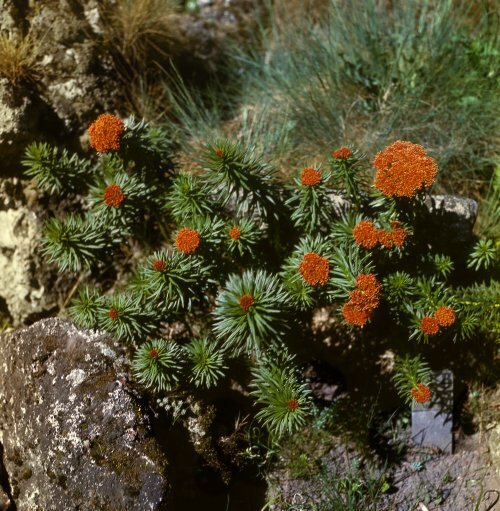 Flowers in dense hemispherical cymes, brick red (staminate) or yellowish (pistillate). V - early spring to early autumn, in St. Petersburg April-September. Fl - May for 2-4 weeks. Fr - July. P - by seed and by division. Does well in full sun and in partial shade. Very attractive. Well suited to the rock garden, especially with rocks of grey colour. Z 4 (3). New.